Before you read our in-depth buyer’s guide, check out our reviews of the best of the best at a glance! We’re going to look at some of the best compact coffee makers that 2019 has to offer. Reviews for this product are largely positive. The AdirChef Grab N' Go personal coffee maker tops our top 10 list with a perfect 10 rating! This machine is designed to fit most cups and mugs, so you can brew the perfect-sized drink in the container of your choosing. Environmentally friendly individuals will also rejoice, as this coffee maker comes with a reusable, dishwasher-safe filter. This purchase can last awhile as it is made with durable yet lightweight plastic. Coming in 6 color options, this incredible machine is available on Amazon for $23.48. A purchase comes with a 15-oz stainless steel travel mug. Making coffee has truly never been easier! The Black + Decker single-serve coffeemaker is the item with the lowest price tag on our featured list, with a unit going for $18.99 on Amazon. This coffeemaker also comes with a travel mug (16 ounces) and reusable grounds filter. People always in a hurry will appreciate the automatic shutoff feature. So, even if you forget to turn this device off before you leave home, you can rest easy. This single-serve appliance is small, so not all cups will fit. This device has a sleek design and earns an 8.9 rating from us here at Top10. Looking for a simple, traditional ol' coffee pot? The Kenmore digital coffee maker earns an amazing 9.5 rating from us for all that it offers. This coffee maker brews up 5 cups, so it’s a little larger than the other items on this list. Other desirable features include programmable controls, reusable filters, automatic shutoff, and the ability to pause brewing. Interested individuals can buy a new black-colored unit for $26.99 on Amazon. While this machine is by no means the most expensive coffeemaker on the market, it is still pricier than our other two picks on this top 3 list. However, it can still be a nice addition to any home. All in all, we think these 3 products will satisfy most coffee-lovers' needs. Interested in learning more after reading our reviews? Read on for our in-depth guide that covers how to buy the best small coffee maker for you! Why Would You Need A Small Coffee Maker? Many people need at least one cup of coffee in the morning to function. However, if you only need just one or two cups to get going, it can be a real waste—both environmentally and financially—to have to brew a whole pot of coffee if you have a large machine. Or, even if you plan on drinking the entire pot, it can get stale quickly. This can result in many trips to the microwave to heat your cup of joe up, and the results, taste-wise, are just not the same. Moreover, many people have limited kitchen counter space. A 14-cup, or even standard 12-cup brewer can hog lots of precious space that could be used for other things. All of this waste is an absolute travesty. 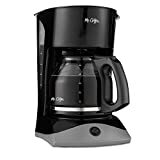 If you are looking to replace or maybe augment your old, standard coffee pot with a smaller or more environmentally friendly version, there is a coffee maker out there for you. Typically, a single-serve or 4-cup coffee maker is classified as a compact version, although this definition is a little flexible. To determine what kind of coffeemaker will best suit your needs, you'll first need to understand a few different types of these appliances. Everyone has their own needs and wants when it comes to coffee consumption, and the market does not disappoint. From espresso machines with a chamber specifically for creating a frothy foam to the easiest pod-powered instant coffee machines, there are pint-sized coffee brewers to keep everyone going. So, let's dive into the different types of coffeemakers and how they differ from each other. A traditional coffee pot with a carafe is probably the most popular brewing device. Most people either have, or have had, this type of machine at one point. It's easy to clean and take care of, and you can buy grounds of varying quality almost anywhere. The sizes of these appliances range from a twelve-cup capacity to a single-serve pot, which allows people to choose how much they brew. These are a great option for those looking for a cheap, reliable little coffee maker. Common features include clocks, programmable automatic brewing, reusable filters, and automatic cleaning options. While these coffee brewers are one of the cheaper options, there are a few downsides. 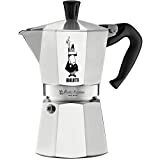 There are fully loaded versions of traditional coffee pots that you can program water temperature, type of coffee you want, or plug directly into the water line, but these options are high in price and can also be quite large. With a small coffee maker, you get exactly what you put into it. You can buy the very best coffee and filters; however, it will oftentimes still take a few minutes to brew even a single cup of coffee. While Keurig is the posterchild for single-serve coffeemakers, the market is filled with these types of machines from plenty of manufacturers. These devices are filled with water, or attached to a water line, and use single-cup pods to make one cup of coffee at a time. There are hundreds of different kinds of pods from brands like Starbucks. This variety lets users have almost any kind of coffee they want at the touch of a button. These units have become insanely popular among those that want to save money instead of heading to the local café before work. It takes maybe a full minute for a complete cup of coffee. from the time you insert the pod and press the button. In some models you can choose what size cup you'd prefer, and have the water automatically heated before you even have to push a button. The are a few downsides to this type of brewing device. This type of machine is expensive. The cost of the appliance and name brand pods (like K-cups) adds up, but it is still lower than getting a cup of coffee at a coffee house every day. However, there is a lot of waste from these types of machines if you use disposable pods, so you are still throwing away a lot of packaging. If you are someone that cares about how much waste you produce, there are reusable pods that can be refilled with regular coffee grounds. If you have the money to put down a couple hundred dollars for a new coffee maker and some high-quality pods, you will probably love this type of machine and the coffee it brews. A simple espresso maker will cost much less than a new programmable machine. Many people swear that a manual brewer makes the best espresso. Using a simple brewer is also much easier. A basic espresso machine is a cheap, easy, and delightful way to get a quick shot of go-go juice in the morning without having to down an entire four cups before work. Many people prefer the versatility of an espresso machine to a traditional coffee pot as they only make a couple of shots at once. Espresso machines are pretty simple to operate as you only need to fill the water reservoir, add the desired amount of espresso into the cup, and tamp it down before replacing all the parts and turning the unit on. You turn it off when the correct amount is reached, and you have the option of adding milk for a nice latte. This is a great way to get that fancy coffee-shop beverage without the coffee-shop prices. Even better? They only take up a small section of your home counter top. This can free up space that an otherwise bulky 12-cup machine would have occupied. As with all small coffee makers, there are a few cons to owning one of these devices. For one, these machines brew strong beverages. As such, people who only need a mild boost in the morning might not want one of these appliances. Espresso itself is fabulous, but it takes a few minutes for a double shot to brew. A simple espresso machine is typically very simple, with no features or pre-programmable options. There is a definite learning curve in preparing the perfect espresso. It takes practice, and it might not be for everyone. However, if you enjoy a great latte or Americano and you are tired of spending so much money at the coffee shop, this might be perfect for you. Nothing beats the perfect cup of iced coffee on a hot summer day. That means, unless you plan on standing in long lines to get a cup, you need to make some at home. That's easy enough with a manual cold drip brew coffee maker. These contraptions are used to brew the perfect iced coffee at home, without the hassle of blending or diluting the coffee with ice. Most cold brew makers are simple in design, much like a pitcher that sits in your refrigerator. As such, they require very little prep work. There are some cold brew electronic machines that sit on your counter and makes brewing quicker, if that is your preference. These appliances use course ground coffee and are easy to set and forget until you need that cup to get going. There are several downsides to coffee brewers like these. One of the biggest issues is that it takes hours for most iced coffee makers to brew the coffee. Instead of using boiling water, these devices use cold water and time to create the perfect cup, so you'll need to prepare these from six to twelve hours in advance. They are also generally pretty difficult to clean, so be sure to do your research before you decide what kind you are getting. However, most iced coffee makers are really easy to use and save you a bunch of money in the long run if you drink iced coffees regularly. Reviews vary, many claim that a drip coffee maker produces superior drinks. Manual coffee makers, such as French presses or pour-over or drip coffee devices, are generally pretty small and easy to use. These require filters, hot water, and a container. That's about it! Many people swear that manual or drip-style coffee tastes far better than any other kind. These units allow you to fully control every aspect of your coffee drinking experience. From what temperature you prefer your water to be when you brew your coffee to what kind of grounds you use. . . there is room to experiment to create a cup of coffee that is perfect for you. Manual coffee makers are full of drawbacks for people who are too busy to give the time and effort it takes to create their cup of coffee, however. It does take longer, and is a process of trial and error. These drips are for someone that really enjoys playing with options, and has the time to make a cup of coffee in the mornings. If you have the time, energy, and want a high-quality drink, though, you’ll probably want to try this device. These combo coffee machines are extremely practical for those that want to consolidate counter space, but also don’t want to give up the multiple functions their various appliances supply. These devices generally don’t make more than one or two cups of drip brewed coffee at once, though there are certainly larger versions out there. Options on these machines are pretty varied, as some come with an espresso machine and milk steamer, or a milk frothing chamber, or they combine a regular brewer with a cold brewer, while some even have a small griddle and toaster oven. There are so many types of the combination coffeemaker out there, it is pretty easy to find something that combines everything you need in one easy-to-use appliance. However, unless you find a version with a reusable coffee filter, you'll have to find filters that fit the machine. Sometimes, due to the shapes of these appliances, finding appropriately sized filters can be tricky. Additionally, though they may be cheaper than buying several machines at once, they are a bit more expensive than buying just one or the other. These combination machines require a bit more cleaning and care than one or the other as you'll have to clean all the parts regularly. Not every machine comes with coffee timer or clock options standard, though, so if that is something you are interested in, you should make sure to double check that it has the options you need. As it stands, these are pretty decent little coffee makers that let you combine multiple uses in one. Making your brew with quality ingredients can really improve taste. Naturally, smaller machines will brew smaller amounts of coffee. This can be a good or a bad thing, depending on your personal preferences. If you want to reduce the amount of caffeine you are consuming, a smaller coffeemaker might reduce the temptation of drinking excessive amounts of coffee. This can really be beneficial for your overall health and stress levels, as research suggests moderate coffee consumption can provide several health benefits, including potentially reduced risks of heart disease and type 2 diabetes. However, some people might find that certain smaller coffee pots produce too little coffee for their liking. Ultimately, it’s up to you to determine whether or not the coffeemaker you purchase makes the right amount for you. If you need a cup to go, a single-serve machine will probably suit you well. If you like to take the time to sit back and relax so you can enjoy your beverage at a leisurely pace, then a pour-over dripper might be for you. Sometimes, smaller appliances require a very specific size and shape of filter. Shopping for special filters can take extra time and money. So, it’s a good idea to double check what type of filter your appliance will need before finalizing a purchase. Moreover, some machines are not compatible with reusable filters or pods. The disposable K-Cup craze has generated a ton of waste. If you really want to reduce the amount of waste you generate (and save some money long term), then make sure that your machine can take a reusable filter. What makes a good cup of coffee? Taste, of course! Some people will swear that cold brew coffee made over a longer period tastes better than brewing something quickly from an electronic appliance, for example. Others want their coffee only from the best drip coffee maker, rather than the standard, cheap 14-cup programmable coffeemaker, for instance. Many people like to grind their own beans, brewing their beverage with a fancy French press. Coffee taste, in other words, largely depends on the individual. Again, how you make coffee is up to you, as there are many buying options available. However, sometimes even a great coffee maker can brew sub-par drinks if they are made with bad ingredients. It’s easy to improve the taste of your beverage just by installing a water filter. This can help remove impurities in the water, which can make it taste better and be safer to drink overall. Regularly cleaning your device’s water tank also makes for better cups of coffee. In other words, always make your brew in a coffee maker that is clean and well maintained. Even the best coffee makers will require a bit of upkeep and maintenance. To make cleaning easier, look for a unit that has a detachable water tank. Not only can a detachable reservoir be easier to clean, but it can also be easier to refill. Win-win! If you have a machine that requires a pot, you should consider whether you want a glass or thermal carafe. Coffee in a thermal carafe stays hot for longer, looks cleaner, and is hard to damage (since this style of carafe is stainless steel, usually). By contrast, a glass pot makes it much easier to see how much coffee you have left at a glance, and the price tag is also generally lower. However, they are much easier to break, and they can burst if you leave them empty on the hot plate. Those willing to spend a little extra can find some technologically advanced devices out there. Most already come with an auto shutoff feature, though not all do. As such, this feature will typically not cost much on a standard programmable coffee maker. On the pricier side, however, are smart home coffee machines, which can hook up to smartphones. This allows people to brew coffee while enjoying their favorite music straight from their cell, for example. Check the price tag: if it’s within your budget, you may be surprised how many extra features you can score on your new brewing device. Just remember, however, that the best coffeemaker is the one you will use and enjoy, not necessarily one with the most gadgets. Reading product reviews is a good way to research coffeemakers. Narrowing down the options can be hard, but as long as you know what you like, you will find the best small coffee machine for you. Start by listing what you are looking for, from price to style. Then, start listing options you would like to search for. Spend some time cruising the Internet, keeping this list in mind. Read reviews on the coffee brewers that pique your interest, and make an informed decision on what coffee maker you think would be best for you. No matter your personal needs, there is bound to be an option out there you can enjoy. You can bring home a great little coffeemaker in no time!